Talent Show: “Thriller, by our Five-Year-Olds”. Brilliant performance … hard to believe they are 5 yr olds. I’ve seen kids slightly older get nervous and freeze-up when they forgot their next move … these girls ad lib moves when they forgot their steps! Marcelita está muito linda e gigante! tentou evitar, mas acabou comandando o passo das demais! Rimos bastante também! Parabéns pelos pimpolhitos! Delightful! My 5-yr-old granddaughter was most admiring. Ahh fantastic costumes, I bet they loved every minute! 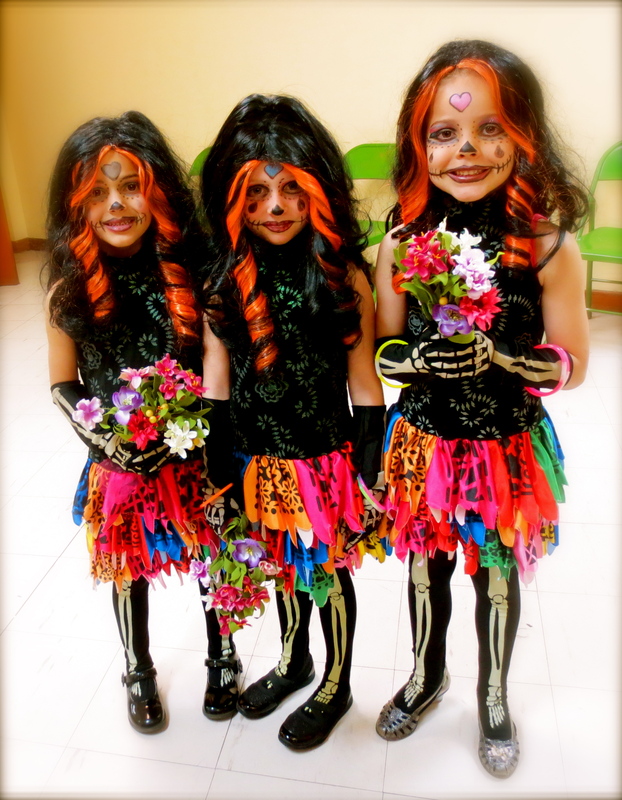 They’re dressed as “Skelita Calavera”, a Monster High character… and, for 5 year olds, we believe they did quite well under ‘Thriller’… using their very own version & understanding! 😮 Thanks for stopping by! Previous Previous post: Showing Support: The Pachamama Documentary Film Initiative!